Get yourself up to date for spring! "If you are serious about finding new business you need to be using Corpdata data". This April we want to offer you a chance to keep up to date with the latest computing equipment, free of charge. For any order of £5,000 or above you will receive a brand new Microsoft Surface RT tablet. For each £500 spent with Corpdata during April 2013 you will receive one entry into our draw to win one of two of these machines. Larger orders are entitled to more entries; so if you spend £2,500, you get five entries! 1. 'Order value' is defined as the total net value of the products purchased from Corpdata after deducting any discounts and before the addition of VAT. 3. ‘Qualifying Orders for Draw Entry’ are orders with an ‘Order Value’ of greater than £500 and less than £5,000. For each whole £500 of ‘Order Value’ you will receive one entry into the draw to win one of 2 ‘Microsoft Surface RT tablet’. 4. ‘Qualifying Orders for Microsoft Surface RT tablet’ are orders with an ‘Order Value’ of greater than £5,000. 5. 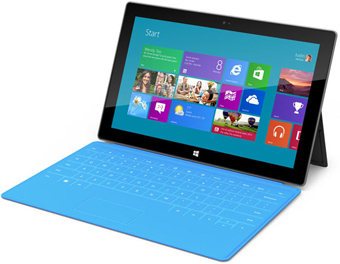 The 'Microsoft Surface RT tablet' on offer is the 32GB standard UK specification. 6. This offer is being made by Corpdata Limited for your company. The winner will need to confirm the 'Microsoft Surface RT tablet' is received on that basis. 7. These offers cannot be used in conjunction with each other or any other offer. 8. The 'Microsoft Surface RT tablet' will be shipped by registered post to a UK addresses as soon as possible after full payment has been received and processed (normally with 28 days). It will require a signature on receipt. 10. Only people who quote the relevant references at the time of ordering will be eligible for this offer, they cannot be quoted retrospectively.